Do you ever have those days (or weeks or months) where one thing after another seems to go wrong? Or maybe things are going right, but not as right as you’d thought they would? Or you’re just plain tired of working so hard to stay in the same place? And you think about giving up. Giving up on that project or job or relationship. It’s tempting because you feel like nothing you try works. You feel alone. 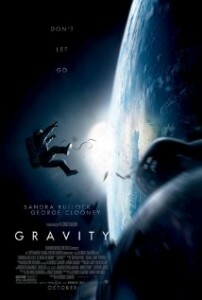 In the movie Gravity, engineer and first-time astronaut Dr. Ryan Stone (Sandra Bullock) ends up as the sole survivor of an accident in space. Her shuttle is destroyed and she’s running out of oxygen. She’s lost contact with mission control on earth. Worse, everything she tries only seems to make her situation worse. She makes it to the International Space Station, only to find the crew there has already evacuated to escape the same debris field that destroyed her shuttle. The parachute on the only remaining module has been accidentally deployed due to damage from the debris field, making it useless for returning to earth. Before she can successfully make contact with anyone on the space station’s radio, the station catches fire. She escapes in the module, planning to use its thrusters to reach the Chinese space station Tiangong and use one of its modules to return to earth instead. Except the thrusters are out of fuel. When she finally reaches the Chinese stations, its orbit is deteriorating (also due to being shoved out of position by the debris field), and she can’t dock with it. She shoots herself across space using explosive decompression and a fire extinguisher and barely makes it inside. And just when she thinks she’s safe, just when it seems like nothing else could go wrong, when the module lands into a lake, a fire causes her to need to pop the hatch. Water rushes in and drags the module underwater. Ryan forces her way out, but her space suit is too heavy and she can’t swim. She sheds her spacesuit and swims to shore. As my husband and I watched this movie, I couldn’t help but think about how there was something to be learned from Gravity about what we can do when we feel like giving up. Think outside the box and try something different. When Ryan was inside the module with no thruster fuel, she realized that she had to find an unconventional solution to her problem. She couldn’t keep trying the traditional solution because it wasn’t going to work. She found a way to trick the module into firing its landing thrusters instead (the ones that are only supposed to fire when the module senses it’s a certain distance from the earth’s surface). Sometimes the solution to our problem isn’t giving up. Sometimes the solution is to look at our situation a different way. Walk through your fear and discomfort. At the start of the movie, one of the biggest things holding Ryan back from making it back to earth alive was her own fear and space sickness. She kept focusing on what would happen if she didn’t succeed. It’s easy when things aren’t going right to allow our fear of what could possibly happen cloud our judgment or make us freeze. But we won’t succeed unless we push past our fear and what ifs. And most of all, don’t lose hope. If Ryan had given up at any point along the way, she wouldn’t have made it safely back to earth. We can’t know what the next minute, hour, or day will bring. And maybe if we hold on and keep trying, it will be the turn for the better we were waiting for. Have you felt like giving up on something lately? What do you do when this happens? When Is It Time to Quit on Our Dreams? All good points, but there’s a subgenre-specific point you missed. Gravity, in spite of a few technical errors, shows movie-goers how exciting hard sci-fi can be. It’s not fantasy (Star Wars), space opera (Star Wars), or military sci-fi (Starship Troopers, Ender’s Game)–it’s just a story about the eeriness and dangers of space exploration. Spoiler alert: I guess you could call it Hamlet-in-Space (almost everyone dies at the end), but it’s the nearest thing to being out there for me since an IMAX documentary on life aboard the ISS. I thought Bullock was a bit wimpy and woefully untrained and I could have done without Mr. Clooney, but none of that or the technical errors degraded my enjoyment while watching, only after the fact. For writers of hard sci-fi (a subgenre hit hard by vampire romances and fantasies), movies like this can only reflect positively. Excellent point where genre is concerned. Scifi doesn’t get the respect I think it deserves, especially hard scifi. I actually told my husband afterward that I had a lot of respect for the writers. Alongside everything else, they allowed you to have a small breather and then threw another obstacle in the character’s face so that she seemed to be worse off than before. That escalating tension is a great way to keep even people won’t don’t generally like scifi interested. Happens all the time. More so since I started writing. Writing is so deeply personal, with an astounding amount of emotional investment. When things don’t bounce back with what I perceive as “equal” feedback, it’s easy to want to curl up into a ball and just give up. I know better than to allow that to happen though. One thing I’ve learned in life is that looking back and wondering “what if” is worse. The “what ifs” end up being the deciding factor for me in a lot of things. I’d rather try and fail spectacularly than to wonder what would have happened if I’d tried. And the older I get, the more I’m learning that the failures along the way teach me something that then contributes to a success later. Great post, Marcy!! I still need to go back and read your one on voice. Love your blog!!! Did you write this for me? lol. I am so discouraged. And sick of being sick. I just can’t get my strength back. These super bugs just keep getting stronger. I worry about my little story and what going to happen to it. Will I lose interest? Will I even be able to write it? This is great timing for me. Thanks Marcy! Your story will survive. You have a lot of courage and determination, and I know you’ll keep pushing forward as you’re able. But you’re right to take care of your health first. Hang in there! Aw, Karen. I’m so sorry to hear that you’re still feeling bad. As Marcy says, hang in there and focus on getting your strength back. Your story will be patiently waiting for you. My last year has been rather up and down, and I was trying to write the book I’m about to release, in snitches and snatches between all the other craziness. I was sure it was crap because I’d been so distracted and had to leave it for such long periods of time and then come back to it. But Marcy just edited it for me and loved it. Your story will get done in due time and it will be great!! I so needed this today! How do you always know what I need to hear? I have been wanting to transition out of teaching elementary school and in to teaching college writing, but I have been scared to take the first step. But you are right, we can’t know what will happen next. I need to just go for it. 🙂 Thanks, Marcy. Chocolate almost always helps! But I know the feeling. As an editor, some days I just want to toss my own projects aside because it’s easier to work on someone else’s.